"There are a lot of bad republicans; there are no good democrats. "Ann Coulter In today's climate of hyper-partisanship, blurred lines between political news, analysis, and entertainment, and outrageous comments from the chattering classes, who better than Tom Patterson to provide students with the tools and context to make informed judgments and become skilled political thinkers? 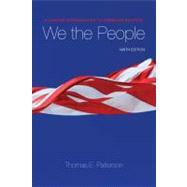 Patterson'sWe the Peoplehas long been a best seller for American government courses due to its insightful, readable, and balanced portrayal of the American political system. The 9th edition continues this tradition of excellence while also introducing a new emphasis on political thinking at a time when the partisan divide seemingly could not be wider and unbiased political information is often drowned out by other sources. With expertise in the areas of public opinion, the media, and elections among other areas, Tom Patterson is a voice you can trust to help develop your students critical thinking skills when it comes to politics and political science. As Patterson notes, "Political thinking takes place within the context of a person's political interests and values, which can lead equally thoughtful individuals to reach opposing opinions on the same issue." If you are looking for learning materials to help ensure your students leave your course among those "thoughtful individuals" that will carry the debate forward in measured and informed ways,We the Peopleis the right choice for you.